The winner of Plant Your Own Garden is No. 6, Char! Congratulations, and have fun putting the techniques into your appliqué bag of tricks! 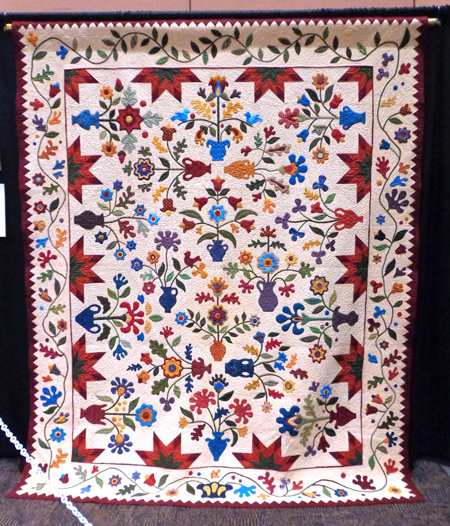 At Quiltfest Oasis in Palm Springs over the weekend, there was a special exhibit of quilts made by members of the Baltimore Appliqué Society. In the booth one day I struck up a lovely conversation with a fellow appliqué enthusiast, who told me she had followed her quilt to California all the way from Maryland. Kelly Kout, I enjoyed talking with you!! 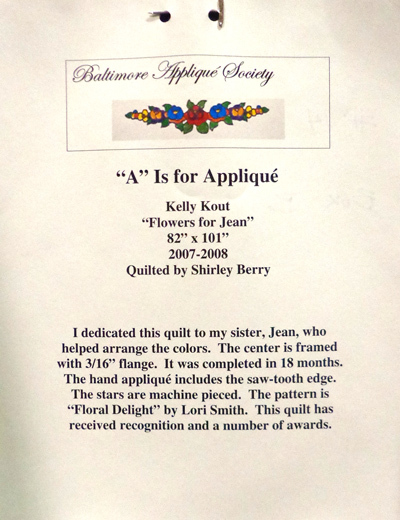 Here’s Kelly’s quilt, “Flowers for Jean,” designed by Lori Smith. That is one gorgeous, amazing, handcrafted masterpiece. 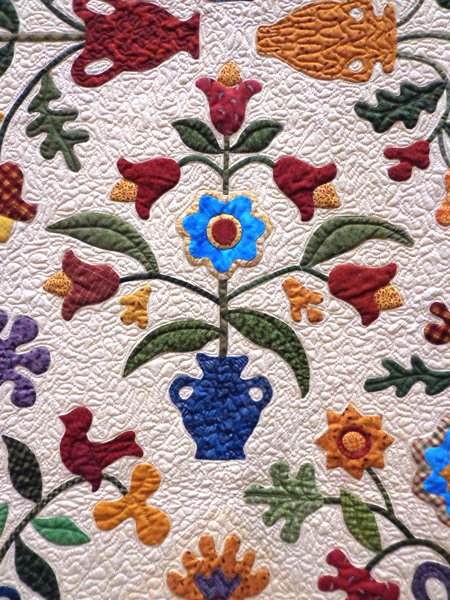 Next week… the fabulous Pacific International Quilt Festival! 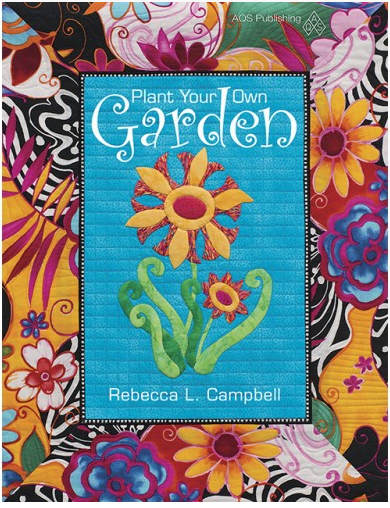 This month, courtesy of AQS Publishing, we have Rebecca L. Campbell’s charming book Plant Your Own Garden. This little book features a dozen original flower blocks that you can use to plant an appliqué garden. Each design can stand alone in a project of your own creation, or join the others in a sampler quilt. Rebecca shares with us what inspired her to become an appliqué enthusiast and to develop her own system for pleasing results. Take it away, Rebecca! I belong to a quilt guild, Quintessential Quilters in Columbus, Ohio. I thank that organization for the opportunity to take classes from an amazing list of famous quilters. Those teachers inspired me in a so many ways. I wanted be a part of the quilting business. but what was I going to offer? A seed was planted and I was searching for my way to inspire. I fell in love with an appliqué pattern and became determined to learn turned-edge appliqué, but my results left a lot to be desired. I wanted perfect shapes right off the bat and didn’t want to spend time tracing or ripping freezer paper out. I matched up products that accomplished those tasks. I eliminated tracing by using a copier to create a placement guide (June Tailor’s Perfect Piecing) and templates (C. Jenkins Freezer Paper Sheets). If I ironed the freezer paper to the right side of the fabric it could be pulled off once the piece is in place. Print n Fuse ironed to batting enabled me to create trapunto without stuffing. Now I had a method that worked well for me. Teaching classes was a test to see if it worked for others. Beginners were excited with their results and experienced appliquérs found it increased their accuracy and productivity. I had a proven method that I titled Innovative Appliqué. Someone suggested I should create an original pattern to teach from. Sixty-one patterns and more in the works are available. All individual patterns are full size. 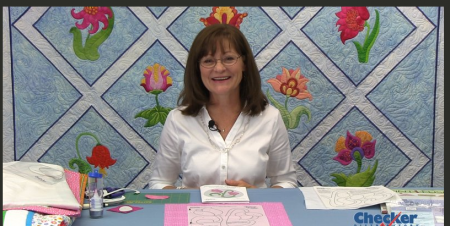 Designing, teaching, vending and trade shows lead to connecting with America Quilter’s Society to publish a booklet, Plant Your Own Garden. Twelve flower patterns, quilt construction, and Innovative Appliqué instructions are all included. I like to provide lots of pictures to show what I am explaining. The booklet patterns do need to be enlarged 111%. That is something I hope to avoid the next go round. I hang a sign at shows that says Appliqué is not a four letter word. I think that is so funny. At a recent Checker Distributors open house, Rebecca filmed a video presentation showing her appliqué techniques. If you’d like to win this booket, please leave a comment before 7:00 p.m. California time on Monday, October 6. Open to U.S. mailing addresses only.